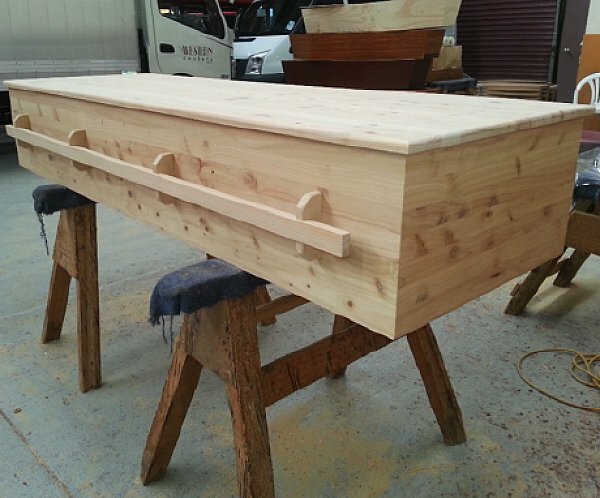 Introducing the Western Caskets Pioneer – Our latest design in a series of traditional styled timber funeral caskets. With its simple yet stylish construction the Pioneer Casket is beautifully crafted in a choice of eco-sustainable radiata pine or macrocarpa timber. Available in a natural lightly sanded finish or with rich grain enhancing Danish oils these caskets are available in a standard size 6/4 22x13 or oversize sizing on request. Please note, Western Caskets does not sell direct to the public, but these caskets are available through a number of Funeral Homes.